The exponential increase of food safety incidents in the past two decades has heightened public criticism and distrust over government regulatory failure worldwide, which has been responded by a proliferation of reforms. Taiwan is no exception to this trend, as numerous food safety scandals have utterly struck the country, generating even more pressure for an expedient, effective, and efficient overhaul. Against such backdrop, the legislature in Taiwan has assumed massive regulatory borrowing. There have been five amendments adopted by the legislature to the Act Governing Food Safety and Sanitation since 2013, each of which addressed different aspects of food safety regulation. In many instances, the amendments directly and unsystematically referred to and borrowed from the regulatory approaches adopted by the United States and the European Union, arguably without adequate consideration of or adaptation to local contexts. This chapter describes this approach as “cocktail therapy” and offers an explanation that the legislature has undertaken such ad hoc regulatory borrowing to save costs and secure legitimacy. Nevertheless, this chapter points out the limit of such regulatory transplant and emphasizes that proper consideration of the local context, including social, economic, political, and cultural factors, is of significant importance in the process of regulatory borrowing. 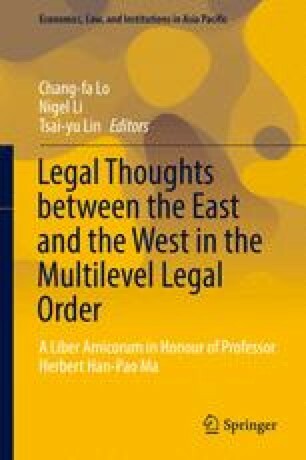 Looking forward, this chapter suggests a constructive next step for the legislative drafter to seriously consider local problems, practices, and needs when learning from a foreign legal model. Only an internationally inspired yet locally adapted regulatory reform can reap benefits from regulatory borrowing as well as reserve a fertile land for regulatory acculturation.